Find out why this insulation is the most popular of polystyrene. 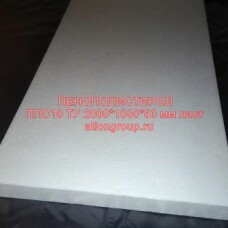 Polystyrene foam insulation with price per sheet in our online store. The heater from foamed polystyrene is one of the most demanded sheet heat-insulating materials in construction. Its effectiveness has been proven by several decades of use in different countries. The large format of this product 2000h1000 mm will reduce the formation of cold bridges, and the thickness of 5 cm will not freeze the covered surface. If this thickness is not enough, then use two or three layers of insulation.